Neuroexcitatory amino acid originally isolated from Amanita species. Neurotoxin often used to model cognitive dysfunctions. NMDA and metabotropic receptor agonist. Also available in simple stock solutions (ab146670) - add 1 ml of water to get an exact, ready-to-use concentration. Functional Studies - Ibotenic acid, excitotoxic agonist (ab120041)Image from Masini CV et al., Brain Res. 2013;1443:18-26. Fig 1.; doi: 10.1016/j.brainres.2012.01.002 with permission from Elsevier. 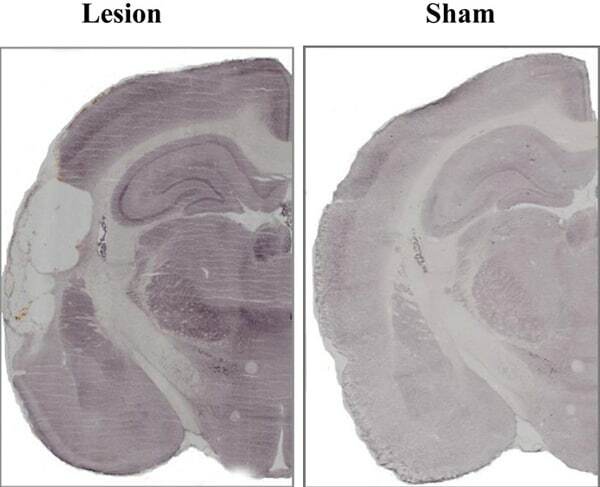 Representative examples of NeuN immunohistochemistry of a complete auditory cortex lesion or sham-operated control section. Rats were anesthetized with halothane and placed in a Kopf stereotaxic apparatus. The skin overlying the skull was disinfected, an incision made, and small burr holes drilled through the skull bone to allow penetration of the injector (Hamilton 1 µl syringe). Bilateral excitotoxic lesions (two per side) were produced by injections of 0.25 µl ibotenic acid (10 µg/µl in 0.1 M sodium phosphate buffer, pH: 7.4; ab120041). The rate of infusion was 0.05 µl/min. The injector was lowered in the brain and left in place 3 min before and 5 min after each injection. Is there a particular method to solubilize this compound? It can be solubilized up to 6 mM with heating in PBS, but it comes out of solution after being frozen at -20C. Thank you very much for your call last week and for your patience while I've been discussing this issue with the lab. Our chemists have re-tested the solubility, and they found that ab120041 was soluble to 10 mM in water and PBS buffer. To achieve this, sonication/vortexing was used, and gentle heating should also help. Have you already tried sonicating or vortexing? It may precipitate after being frozen but it should go back into solution following the same steps. I hope this information will be useful, but please let me know if you have further questions or need anything else and I'll be happy to help. Product normally arrives on an ice pack but the latest delivery came at room temperature. Is this ok, will the product still be useable? Thank you for contacting Abcam yesterday about ab120041. This compound is normally shipped at room temperature. As this product is shipped at ambient temperature it is considered to be stable for the duration of shipping and normal handling. Upon receipt it should be stored at -20°C.